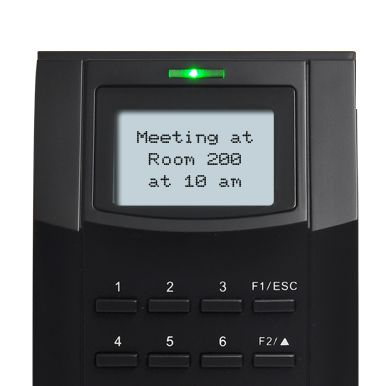 Kadex is an RFID card reader system designed for access control & time attendance. 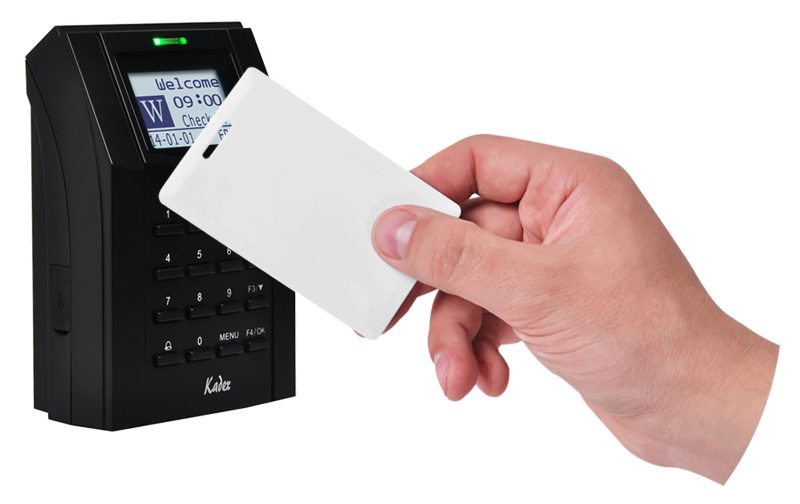 Can contain up to 30,000 users and 50,000 transaction logs, this simple yet powerful card system is a great buy for your business’s premises. 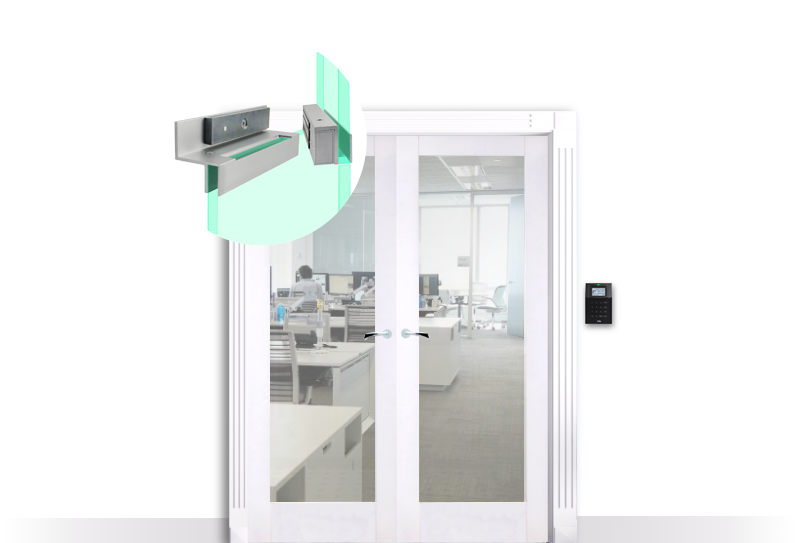 What’s more, Kadex system works side by side with a security alarm system to alert users in cases of break in or when the duress function in the terminal is activated and it can be integrated with a fire alarm system to unlock all doors when the fire alarm is triggered. 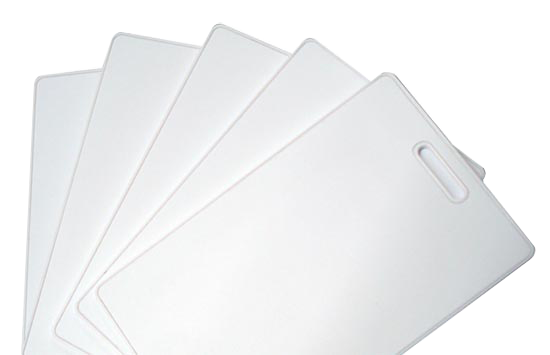 Kadex utilizes RFID card technology, a proven technology for access and attendance, works everytime. The model can store up to a total of 30,000 users and 50,000 transaction logs, more than sufficient to cater to medium to large sized businesses. 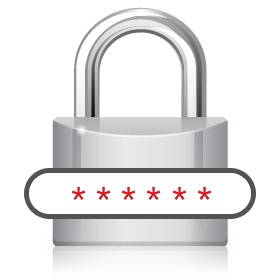 Kadex offers not only card verification, it also provides 5-digit password and the combination of methods to achieve tighter security. 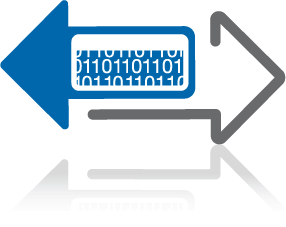 Complemented with a simple management system, just swipe an administrator card to enroll, delete, or reset the terminal. Increase security level by installing an external alarm, and be alerted during emergencies such as break-ins or fire emergencies. 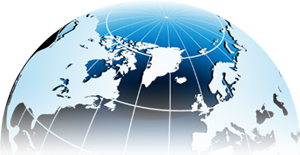 Program Kadex with a total of 50 time zones – perfect for companies with multiple work shifts. Support the common Normally Close (NC) door lock system and Normally Open (NO) door lock system. Support TCP/IP, RS232, RS485 and USB Disk for an easy data transfer. 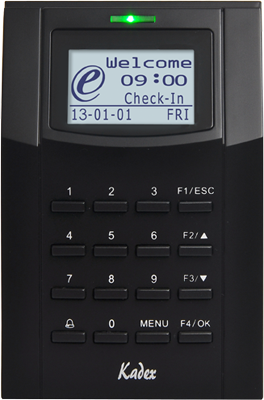 Communicate with your employees by personalizing a short message to be displayed at the terminal whenever they verify. 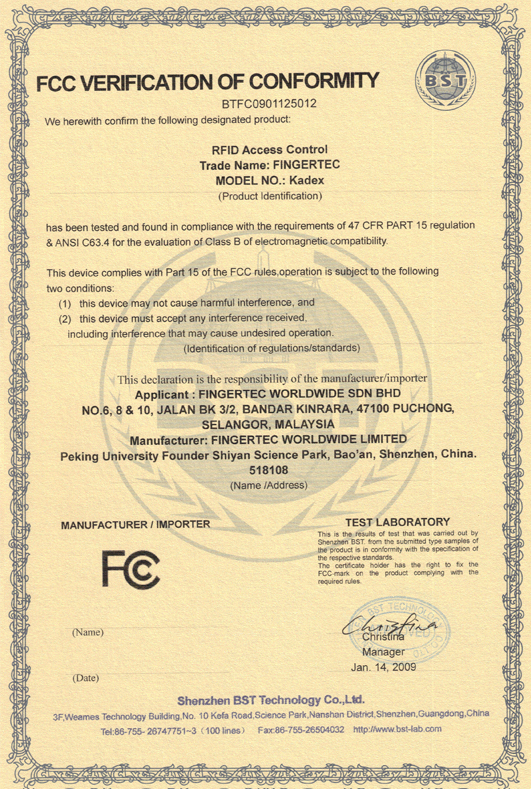 The message can be directed to an individual or to a group of staffs. Let your employees experience independence by reporting their whereabouts via Kadex workcode function. 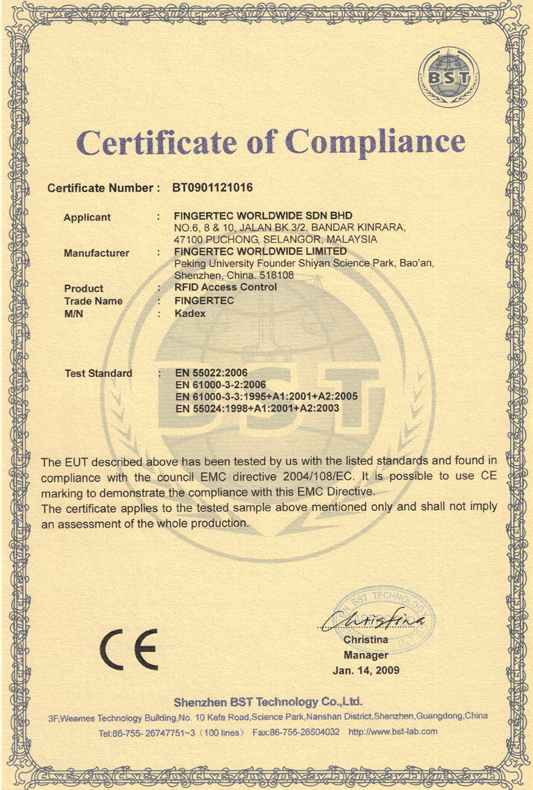 The terminal complies with international standard of CE & FCC, our testament to safety & quality. 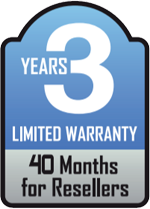 The long warranty period speaks volume about Kadex's quality. Supports up to 25 different languages (English (Standard), Arabic, Malay, Indonesian, Chinese (Traditional), Chinese (Simplified), Cantonese, Thai, Vietnamese, Korean, Spanish, Portuguese (Portugal), Portuguese (Brazil), Polish, French, Russian, German, Italian, Turkish, Persian, Slovak, Greek, Dutch, Hebrew, Romanian, Bulgarian).